BUENOS AIRES, Argentina (CNN) -- An estimated 10,000 Argentines marched on the historic Plaza de Mayo in the capital, Buenos Aires, on Wednesday to demand more anti-crime measures, reflecting a top priority among Argentines, according to recent polls. 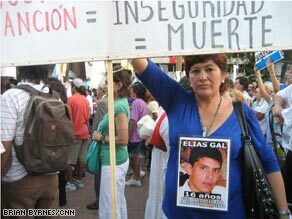 Graciela Lopez takes part in the march on Wednesday. Her 16-year-old son was killed by a drunk driver in 2007. There were other anti-crime marches throughout Argentina on Wednesday night, as well. At least three police officers have been killed in Buenos Aires in recent weeks, and other high-profile crimes have grabbed the nation's attention. An employee of Argentina's most famous TV talk-show host, Susana Gimenez, was killed last month. That prompted Gimenez to call for the return of the death penalty. The death penalty was outlawed in Argentina in 1984, a year after the country's military ended its seven-year dictatorship, during which some 30,000 people were killed. Organizers used the Internet to mobilize people, setting up a Web page asking Congress to declare a national security emergency, and creating a Facebook page for the march. More than 106,000 people signed up as "friends." Those gathered in the Plaza de Mayo -- many carrying photos of their dead loved ones -- asked their leaders to act against rising crime. "We need to scream loud, so our president can hear us. All social classes are being affected by this crime wave. There needs to be sanctions for those responsible for this insecurity," said Graciela Lopez, 43, whose 16-year-old son was killed by a drunk driver in 2007. "The police patrol cars hardly ever pass by. We are surrounded by delinquents. Our kids can't even take the bus to school without being worried about being assaulted. We are here to ask the government to get aware of what is happening to us, and that our president finds an answer for this insecurity," said Liliana Peyrera, 41, who owns an ice cream shop in the Buenos Aires suburb of La Tablada. Argentine President Cristina Fernandez de Kirchner has been criticized for not focusing enough on crime. Her justice minister has defended the government's efforts, saying Argentina has one of the lowest murder rates in South America. "The government -- from the president to the senators to the judges -- they need to comply and uphold the laws that exist. We don't need new laws; we need to prosecute people that break the law," said Jorge Quiroga, 62, a mechanic who attended the march with his wife.